Just add water and you’ll have long-lasting energy with our NSF Certified for Sport® energy drink. Our energy supplement leads the sports nutrition industry in their clean ingredients that give athletes and fitness enthusiasts an edge! P4 is your best fitness ally when it comes to energy support. It’s full of electrolytes that keep you hydrated throughout your workout and provides energy and endurance support! Formulated with a delicious tangerine flavor, our energy supplement is delicious and convenient – just add water to mix into an ideal pre-workout energy drink! Not to mention, our energy drink is always NSF Certified for Sport®! What is in Energy Formula? Why: This fast-digesting complex carbohydrate digests easy while supplying a lasting energy at a greater rate than other carbs like dextrose, pasta, bread, or rice. Other benefits include its ability to preserve muscle mass and assist recovery. Why: Studies show that dehydrated athletes underperform when compared to athletes that remain adequately hydrated. And refueling with electrolytes enables cells, nerves, muscles, and organs to maintain regularity. Why: Caffeine is a central nervous system stimulant known to provide enhancement to focus and alertness, a reduction in fatigue, and an increase in stamina. Why: Taurine is an amino acid that supports neurological development and helps regulate the level of water and mineral salts in the blood. Taurine is also thought to have antioxidant properties. 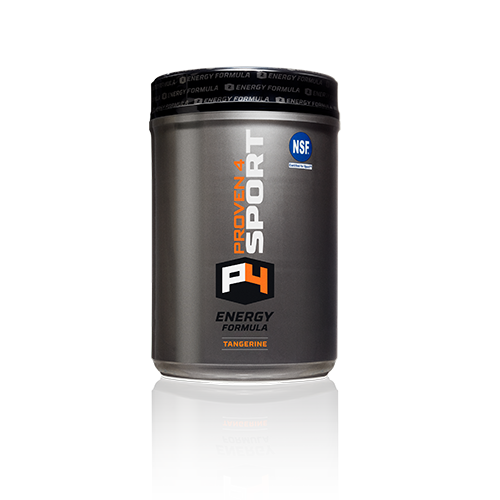 P4 is dedicated to creating the best post workout supplements for athletes of all levels. The NSF Certified For Sport emblem on our labels serves as proof that our products are label-claim- verified and banned substance free according to the World Anti-doping agency (WADA). Combine 1 scoop (28g) of Energy Formula with 8 oz. of water in a shaker bottle. Shake it up and consume Energy Formula during or after your game or workout. Continue to own your competition or annihilate your workout.